Egg and curd mask is considered effective for dry, frizzed out and unmanageable hair. Here I am sharing a home made dry and frizzy hair treatment mask that contains natural and herbal ingredients, being herbal this dry and frizzy hair treatment mask is free from any side effects. All the ingredients required for making this mask are easily available, certainly you can easily get them from your kitchen. Once a week application of this hair mask will bring back the moisture leaving your hair dandruff free, shiny, silky and manageable. For more home remedies for healthy hair and skin whitening click the links below and let me know about your feedback in the comment section. Add all the above mentioned ingredients into a small bowl and mix well to form a smooth mixture. 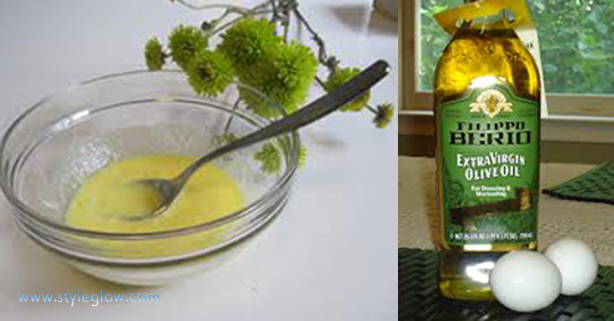 Apply this mixture firstly on scalp (massage gently in circular motion) then fro hair roots to tips. Cover your head with a plastic shower cap for 50-60 minutes. Wash your head with lukewarm water using mild shampoo. Olive oil contains vitamin A, vitamin E, and antioxidant that heels dry, rough and flaky scalp, it’s penetrating ability make it an excellent product for hair treatment because it can penetrate easily in hair roots making hair healthy and damage free. Apple cider not only helps to remove dry and dead skin cells but also make the hair shiny. Egg yolks contain all the nourishing ingredients, egg yolks when used on hair roots can condition, nourish, increasing overall hair growth and health. Curd is having antioxidant properties, helps in heeling flaky scalp and works as a moisturizer locking moisture in the scalp.